Players will be exposed to our exclusive curriculum (view here) throughout our action packed performance academy. Coerver Coaching is the #1 Skills Teaching Method in the World! Players must wear appropriate soccer apparel and shin guards. Indoor soccer trainers/tennis shoes must be worn for each session of the program – no soccer cleats. Our expert instructional programs (camp, class, clinic) use the Coerver Coaching teaching method to ensure that each player is learning and having fun, no matter what the age or skill level. The curriculum is represented by The Pyramid of Player Development©1997 which consists of 6 building blocks. 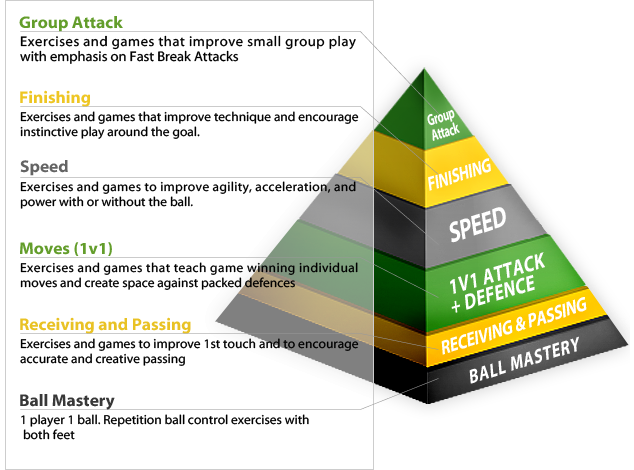 Each block combines dozens of games and training exercises for all ages and many have been featured in the Coerver® Coaching book, “Master class” series and the “New Era” video series. All the exercises can be used by both coaches who are planning team training sessions and by players practicing on their own. Our summer and winter camps are available to players 7 to 14 years old and feature a variety of activities and games to encourage the use of specific skills being focused on each day. We teach more complicated moves that swiftly puts players into competitive environments with an emphasis on 1v1 to 3v3 play, building up to small group tactics, and small-sided games featuring transition. The importance of fast transition play is stressed and players are encouraged to play creatively and freely and to use their new skills in games. Players are also put in many situations requiring decision-making as that is a key ingredient to advanced play. Over three decades of cooperative curriculum development affords us a finely tuned method for getting the skills incorporated into the competitive environment as quickly as possible while building confidence along the way to enable players to come away from our camp with a the ability to showcase their newly learned skills.